In the last two weekends I tried this game with my team on GP Charlotte and GP Minneapolis. They really enjoyed it, I thought I could share it with you in case you wanted to post it. It’s a variation of the token game combining it with elements of secret role games like Love Letter. It was a lot of fun and motivated interaction among team members and sharing of interesting rules and policy scenarios. I hope you like it. The goal of the game is to collect the most points at the end of the day. 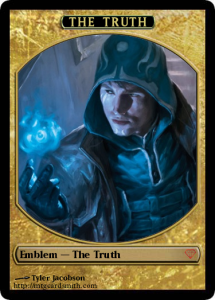 During each round, judges will trade cards trying to finish with ‘The Truth’. 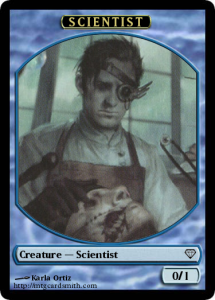 You will need a micro deck consisting of 1x ‘The Truth’, 1x ‘Lab Fire’, and enough ‘Scientist’ so that everyone on the team has one card. At the beginning of each tournament round, shuffle the cards and secretly deal one card to each teammate. During the round, a player may approach any other player. That player asks a rule or policy question. If the correct answer is given, the two players must swap cards. 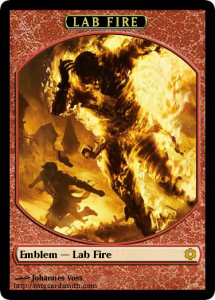 The one exception is ‘Lab Fire’, who can never trades cards (but can still approach and get approached by other players). – If the judge started the round holding ‘The Truth’, they gain 1 point. – If they received ‘The Truth’ during that round (including by a successful guess as the ‘Lab Fire’), they gain 2 points instead.